In The Eyes Of The Beholder: team building... yahoo! Me and my team mates went to a resort yesterday. The activity is what we call team building. It's the time when teams get together not to discuss about work but to have fun. It was actually our team's first team building after almost 9 months of working together. We planned to have team building a long time ago but not everyone could agree on the schedules. But finally the first team building happened. 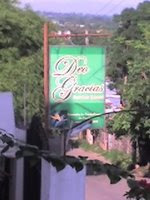 The resort was named Deo Gracias. 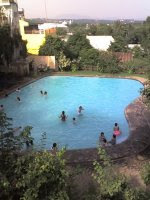 It was located in the suburbs of Antipolo - a more than an hour drive from Makati. We were supposed to go there together as a team and were supposed to meet at 5pm but unfortunately, I was left behind. I overslept and almost forgot about it. Good thing Michelle woke me up but it was too late. My team mates already went ahead of me. Worst is I have never been to Antipolo and have to find the resort myself. That didn't scare me though. I was up for the challenge. So off I went and just asked people for directions. That's what I always do everytime I go to a new place. My colleagues are still preparing for dinner when I arrived at the resort. It was a nice place with two big swimming pools. I wasn't tempted to swim though because I still have a plaster on my neck. By the way, I wounded my swelling neck with a comb. So clumsy, right? So I just spent the night singing my heart out on the karaoke while my team mates enjoyed themselves in the pool. I was enjoying watching them at the pool last night. I wish I could join them but I can't. There were a lot of chitchats and I got to know more about my colleagues. I actually had fun with them. Most of them got wasted because they drank a lot of gin and began acting silly. They were really funny! I have abstinence from alcohol so I was the only one sober when the night ended. huwaw... kewl place.. ganda!! buti pa kayo may team building program..